Hand-Buch oder kurze Anweisung wie man Naturalien-Sammlungen mit Nutzen betrachten soll / von Daniel Gottlob Rudolph .. This past Christmas, class P3/4S at the Papdale Primary School in Kirkwall, Scotland, received two class pets: a pair of goldfish named Bubbles and Freddy. Alas, Bubbles and Freddy were not long for this world, and they recently passed away. When confronted by the merciless hand of Mother Nature, the students did not resort to the preferred method of dead goldfish disposal—which is to say flushing the critters down to a mucky grave in the public sewage system. Instead, the BBC reports, they gave Bubbles and Freddy a more dignified send-off, in the form of a Viking funeral. The class had been learning about the Vikings and their belief system when Bubbles and Freddy departed from this Earth, and (if you subscribe to Viking lore) were carried off by Valkyries into Odin’s Hall of the Slain. “We decided to send our fish to Valhalla with a Viking-style burial in a Long Ship we made that day,” Papdale’s blog explains. Working in teams, students made longships out of household items like egg cartons and tea boxes. Then they walked to a riverbank and read tributes to the deceased fish. (Sample: “Freddy had bright orange scales. He was very fat. This is because he nearly always was quickest to the pellets”.) When the eulogies concluded, a teacher waded into the water and set the goldfish’s resting place alight. Funeral rites for noble Norsemen like Bubbles and Freddy were indeed grand affairs, replete with maritime symbolism. The most impressive example in this regard is arguably a large, 9th-century C.E. ship found buried in Oseberg, Norway. According to the Museum of Cultural History in Norway, the bodies of two women were discovered inside the ship, surrounded by luxurious gifts in 1903. Their identities remain unknown. Other longship burials have been discovered over the years, among them an 8.5-meter boat interred in Oslofjord, Norway. Professor of archaeology Neil Price writes on the British Museum blog that the remains of a man, two women, an infant, and several animals were laid to rest inside the boat. Rather than inhume Bubbles and Freddy, Papdale students opted for a funeral at sea. The egg carton longship floated best, the school writes in its blog. The one carrying the goldfish tipped over mid-funeral, but at least the children “enjoyed giving them a good send off to Valhalla,” according to the blog. Rest in peace, Bubbles and Freddy. Rest in peace. Since the National Park Service was founded 100 years ago, Maine has only had a single national park to call its own. But now, report Juliet Eilperin and Brady Dennis for The Washington Post, that could all change with the announcement of a new national monument that could eventually become the state’s second national park. Today, President Obama created Katahdin Woods and Waters National Monument, an 87,500-acre swath of Maine forest and water in the state’s North Woods. The monument will protect a diverse area filled with some of Maine’s most beautiful land—a stretch of species-rich forest along the Penobscot River that was donated to the federal government by Roxanne Quimby, co-founder of Burt’s Bees. At first blush, the transfer of wondrous natural land from an owner to the government might seem simple, but in this case it was anything but. Though the transaction itself went off without a hitch, the proposed exchange has been debated and fought for over a decade. As Nick Sambides Jr. reports for The Bangor Daily News, Quimby’s donation was opposed by everyone from state legislators to local sportspeople, who argued that the park represented a federal encroachment into the notoriously free-spirited state and that it might make it harder for hunters and fishers to access the area. Quimby and her supporters had an ambitious vision: To turn the donated land into America’s newest national park and donate funds for the park’s operation, to boot. But the concept was loudly denounced by opponents. As Brady Dennis previously reported for the Post, Quimby was accused of closing off access to hunting and recreational use despite local custom and eventually she put her son, Lucas St. Clair, in charge of the effort. The proposal evolved into a national park and national recreation area instead—one that would allow mixed use and close off fewer of Maine’s timber resources. It gained traction via conservation groups and the support of local stakeholders like the Penobscot Nation, who originally inhabited the area. President Obama’s designation, which the White House heralded in a press release as one that “will build upon the robust tradition of growing the park system through private philanthropy,” sidesteps the national park question by turning the area into a national monument. The less-prestigious designation has an ulterior motive: While sitting presidents can designate areas as national monuments under the American Antiquities Act of 1906, only an act of Congress can create a national park. Thus far, Obama has created or expanded more than two dozen national monuments and increased protected lands and waters in the United States by more than 265 million acres. This move is expected to set the stage for Katahdin to become Maine’s second national park. As Eilperin and Dennis report, it could be the last such site on the East Coast. “It may be one of the last, large national parks that we see in our lifetime,” Theresa Pierno, president of the National Parks Conservation Association, told Eilperin and Dennis. That is, if it becomes a national park at all. For now, though, it’s a monument—the only one within the National Park Service that will allow hunting, per a compromise provision attached to Quimby’s gift. There may have been strings attached, but for the thousands of campers, hikers and sportspeople who can now enjoy the parks (and the species who will be protected by the new designation), all that matters is that it's now designated. Think of a hyena, and you'll probably picture a giggly beast loping across the east African savanna—or, if you’re really up on your mammalogy, one of the other three hyena species that roam Africa and the Middle East. But you could just as easily envision a hyena much closer to home, trotting around the rocky terrain of Arizona. That's right: For a time, America had its very own hyena. The beast’s introduction to paleontologists began in 1901. That year, workmen at the Val Verde Copper Mines in Anita, Arizona were poking around nearby limestone exposures when they came across a wealth of broken fossil mammal bones. News of the find got out to paleontologist B.C. Bicknell, and the legendary fossil hunter Barnum Brown even came out from New York to pick up a few specimens in 1904. The haul included the remains of squirrels, pocket gophers, pronghorn, and what at first looked to be jaw fragments from a big cat. However, for reasons unknown, no one rushed to describe the fossils. Eventually the bones made their way to what’s now the National Museum of Natural History, and it was there that paleontologist Oliver Perry Hay determined that the fossilized feline was really something else. The cusps and troughs of the preserved teeth—telltale clues for mammal paleontologists—allowed Hay to figure out the jaw had belonged to a hyena, the first and only species of its kind to make it to North America. But how did the hyena get to North America, and how did it live? After Hay’s initial description, Chasmaporthetes specimens of different species were found in Africa, Europe and Asia. These specimens track this hyena’s origin in the Old World before, sometime between 5 and 3 million years ago, it traveled over the Bering Land Bridge. From there, the beasts got as far south as northern Mexico and as far east as Florida. Even though the American species was first to be named, Chasmaporthetes fossils found in Africa, Europe and Asia are more complete. According to Zhijie Jack Tseng, an expert on fossil carnivores at the Jacobs School of Medicine and Biomedical Sciences at the University at Buffalo, only a few isolated teeth, skull fragments and limb bone pieces have been found. “I would say no more than 30 percent of the skeleton of Chasmaporthetes is known” from America, Tseng says. Still, it’s enough to know that Chasmaporthetes really was a hyena that mingled with America’s ancient fauna. For a time, between 3 and 1.5 million years ago, hyenas coexisted with sabercats, bone-crushing dogs, mastodons, pronghorn and other mammals that made North America a mix of the strange and the familiar. We know what Chasmaporthetes looked like mostly because of finds elsewhere. Compared to today’s spotted hyenas, fossils show, this extinct species was a bit smaller and lacked the hunched posture. Instead Chasmaporthetes had proportions more like a wolf, “with relatively elongated foot bones indicative of increased running capability compared to spotted hyenas,” Tseng says. In other words, this was a running hyena—even better-suited to chasing down prey over long distances than even today’s spotted hyena is. And much like its modern relatives, Chasmaporthetes had an impressive bite. “A study of skull mechanics by my Spanish colleagues and I demonstrated that the skull of Chasmaporthetes was just as capable of handling bone-cracking forces as spotted hyenas,” Tseng says. Chasmaporthetes may have crunched bone less often than modern hyenas because of its smaller size, but it nevertheless was capable of turning a carcass to splinters. Chasmaporthetes wasn’t the only carnivore capable of such feats during its heyday. The continent was also home to wild dogs capable of running down prey and busting bones. “Hyenas and canids seem to have had a multi-million year competition for dominance,” Tseng says, “and dogs were ultimately victorious.” Exactly why the hyenas died back, though, is a mystery. It may be that the dogs were simply more adept at catching prey, outcompeting Chasmaporthetes. The very last of their kind seem to come from the 1 million year old deposits of El Golfo, Mexico, on the southern part of their range. This may have been a last refuge from the wolves that made their way back into North America and were chasing down the same prey. Still, the hyena had a good run. The geographic span of Chasmaporthetes fossils from Africa to Europe to Asia to North America “makes them one of the most widespread carnivorans of all time, only dwarfed by canids such as the red fox,” Tseng says. And there may be much more of them yet to find. “The fact that all Chasmaporthetes fossils in North America are found in the southern U.S. and northern Mexico is likely a result of a big geographic gap in the hyena fossil record,” Tseng says. The hyenas must have ran across through the Pacific Northwest and the Great Plains to reach their haunts throughout North America. “It really is a shame they are extinct,” Tseng says, “because I would love to see a globally distributed hyena living today.” Time will tell. Perhaps, if today’s hyenas survive the Sixth Extinction our species are intent on creating, they could spread across the continents at some future time. Imagine that for a moment, standing on the North Rim of the Grand Canyon to hear the eerie whoops and giggles of hyenas returning to claim the southwest once more. On November 28, an incoming snowstorm pushed a swirl of 25,000 snow geese into the vicinity of Butte, Montana, reports the Associated Press. That’s about five times as many geese as the city sees in a whole year. And in many places, such a large flock of the bright white birds with black-tipped wings would be exciting. But for employees at the Berkeley Pit, a 700-acre gaping hole filled with contaminated water, the incoming geese were a nightmare. That’s because the Superfund site is death trap for the birds, a 900-foot-deep, highly acidic former open pit copper mine contaminated with heavy metals like cadmium, arsenic and cobalt. About 10,000 of the birds landed on the water, one of the only bodies of open water in the area, since their typical stopping point at Freezout Lake was frozen, reports Susan Dunlap at Montana Standard. Employees worked through the night using noise and flashing lights to chase the geese away. The next morning, the AP reports, employees had scared off 90 percent of the geese. But not before many of the birds succumbed to the red-colored toxic stew. Officials are still tallying the death toll and the AP says they expect the tally to be at least four digits. It’s not the first time geese have perished at the site. Ben Guarino at The Washington Post reports that in 1995, the carcasses of 342 snow geese were collected from the Berkeley pit, which ceased activity in 1982. Though Atlantic Richfield Company initially denied the water was to blame, instead claiming the birds ate tainted grain, later necropsies showed that the digestive tract of the geese were covered by sores and blisters caused by the acidic water. The site is too large to construct a netting system or other permanent goose-deterrence device, so the company began a project of hazing the birds away from the contaminated water, using rifles shots to scare off incoming flocks and large loudspeakers blaring the noises of predators. Those efforts seemed to work. According to Dunlap, though 22,000 birds visited the mine between 1996 and 2001, only 75 deaths were reported. Guarino reports that 14 birds died in the pit between 2010 and 2013. The size of the flock this time around, however, simply overwhelmed the deterrence system. Twenty of the dead birds have been collected for study, and if the companies managing the mine are found negligent, the EPA will issue fines. But Thompson argues that the incident was caused by a perfect storm of events—increases in snow goose numbers in recent years combined with a late migration after a warm fall and then sudden snowstorm created a unique condition. While snow geese overwinter in the Mississippi delta and in some coastal areas, they are a rare sight for most Americans. They bypass much of the country on high-altitude migratory flights from Mexico to Canada, stopping in huge groups to refuel. It’s believed that changes in farming techniques in the last 20 years have produced more waste-grain for the birds to feed on, causing their numbers to boom from three million individuals in the 1970s to about 15 million today. I grew up in Lodi, NJ and I love it here. Our town is never really known for anything unless we flood, which happens every other weekend. We are a fairly small town, and we are one of the most diverse places ever. We literally have all types of ethnicities here, and we all seem to get along pretty well. We aren't the richest town ever, and the fact that we flood so frequently certainly doesn't help. But we do live right outside of NY, so that's a pretty big plus! Guinness World Records has answers to some of life’s most burning questions –Who is the largest living cat? How long is the longest metal coil passed through the nose and out of the mouth? What is the most jelly eaten with chopsticks in one minute? The book itself holds a record of its own: best-selling annual publication, having sold over 134 million copies in its six-decade run (it celebrates its 60th anniversary this week.) But what is it about the grotesque, the extreme and the unusual that incites such a strong following? It was a curiosity about the fastest game bird that inspired the creation of Guinness World Records. In 1951, Sir Hugh Beaver, the managing director of the Guinness Brewery, missed a shot at a game bird during a hunting trip and wondered aloud if it could possibly be the fastest game bird in existence. 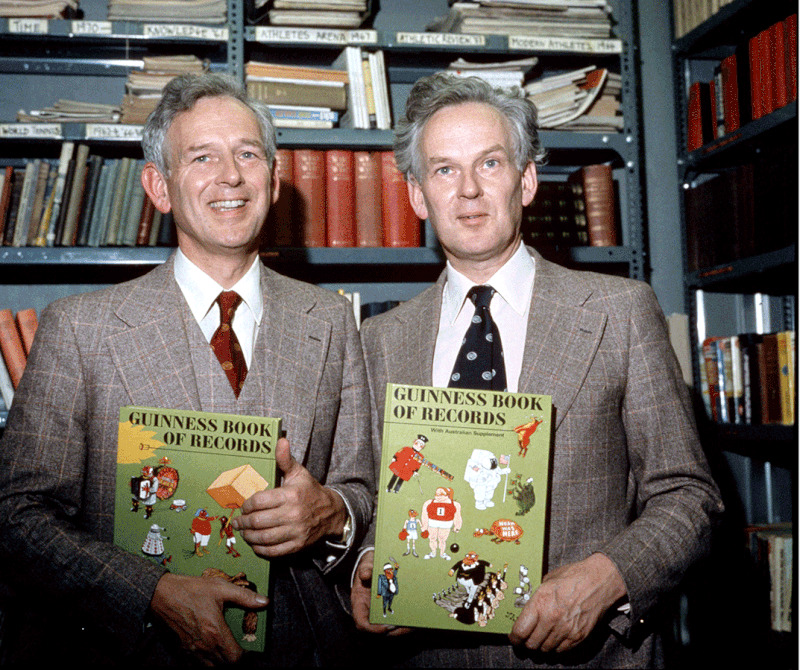 A few years later, upon realizing there did not exist a record of superlatives such as the fastest game bird, Beaver enlisted the assistance of two journalists, Norris and Ross McWhirter, to write the first edition of the bestseller. After more than 13 90-hour weeks, the editors finally published the book on August 27, 1955. At first they only printed 50,000 copies of the argument-settling book to supply to pubs as promotional material for the Guinness brewery. The copies even had waterproof covers to protect them from the inevitable spills at the pubs. But as soon as they grasped the retail possibilities of the material they had produced, the editors sprung into action to publish an edition to release to the public by October that year. There’s no shortage of record-seekers: The company receives around 1,000 applications every week. And though a few of the records, such as "heaviest pet" or "most hamburgers consumed in one sitting," have been retired for ethical reasons, about 75 percent of the applications are for new records. Records are frequently challenged and broken, such as most apples bobbed in one minute, but some records have remained on the books since the first iteration of the records in 1955. Adjusted for inflation, Gone with the Wind remains the highest grossing movie at $3.44 billion and John D. Rockefeller’s wealth is unrivaled at $189.6 billion. No one may ever be able to crack Rockefeller’s record, not even Bill Gates whose net worth rounds out to $79.2 billion, but it’s not the rich and famous who draw readers in droves to the Guinness World Records book - it’s the average Joe doing the extraordinary. “It’s amazing how many “ordinary people” end up being a Guinness World Records holder,” says Harper.